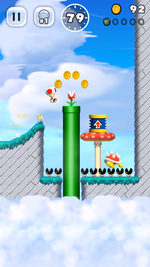 World Star is the special world of Super Mario Run that was added to the game in version 3.0.4. Although its exact terrain is unknown, it contains nine levels that consist of the jungle, airship, mansion, desert, sky, and tower themes. 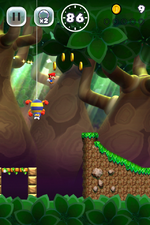 World Star -1 Scuttlebug Forest A jungle level with Goombrats and Scuttlebugs. Defeat Bowser with Princess Peach in World 6-4. 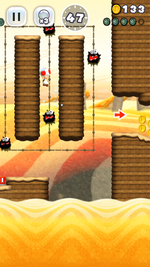 World Star -2 Airship Armada An airship level with Ninjis, Burners, and Cannonballs. Clear World 1-1 with five coins or less. 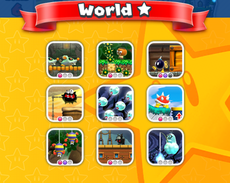 World Star -3 Fishing Boo Taunts You A haunted-themed level with Fishing Boos. Win Toad Rally three times in a row. World Star -4 Desert Fuzz A desert level with Fuzzies and Pokeys. 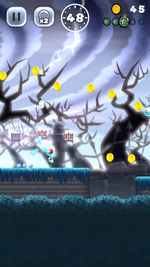 Collect 30 or more medals in a single round of Remix 10. 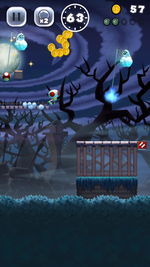 World Star -5 Dark and Stormy A dark haunted-themed level with Boos as well as thunderstorms that strike them. Clear World 4-1 with 60 or more left on the timer. 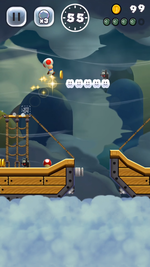 World Star -6 Wild Slopes A sky level with Munchers, Big Spinies, Piranha Plants, and Koopa Paratroopas. Clear World 1-2 with 400 or more coins. 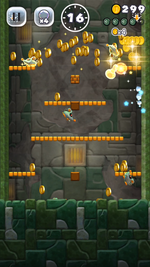 World Star -7 Scaredy Rat Race A tower level with Scaredy Rats. Clear World 4-2 without defeating a single Goomba. 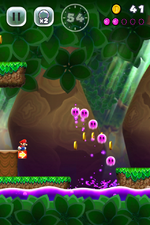 World Star -8 Spike Bar Jungle A jungle level with Goombrats, Poison Bubbles, River Piranha Plants, and Spike Bars. Clear World 5-1 with 300 or more coins. 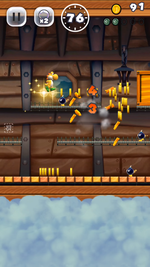 World Star -9 Airship Plunder An airship level with Bob-ombs, as well as a boss battle against two Boom Booms. Defeat 20 or more Ninjis in a single run in World 2-4. This page was last edited on August 25, 2018, at 23:16.